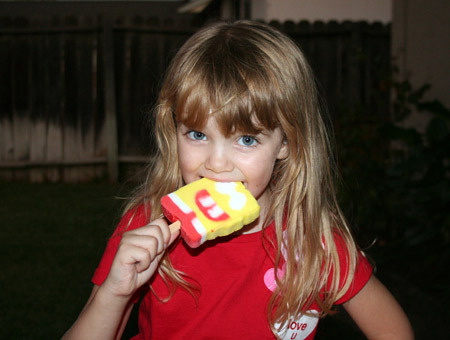 This memory was posted in Outdoors Fun and tagged Grandpa, ice cream, Sponge Bob on February 10, 2010 by Grandma Kc. My memories are of Dairy Queen. We would ride our bikes there. Ours too was closed in the winter. I don’t have grandchildren yet to share this with, but hopefully one day. A few weeks ago we were driving through the town that my grandparents lived in when I was a child. As we drove through town I wanted to take a detour to the ice cream shop of my youth where my beloved grandpa would buy me a BLACK licorice ice cream. My grandma was not as impressed with the black smears on my face and fingers and would hover with a napkin moistened from the water fountain! 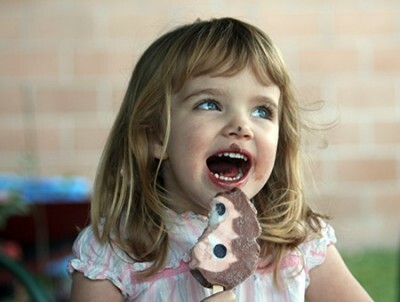 We have an ice cream truck that comes around sometimes but I just realized he’s never come around when the kids are over here…! 🙂 Well so far it’s just been popsicles on the porch this summer ! 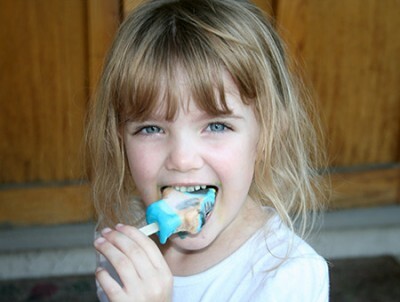 We eat a lot of popsicles around here, too! 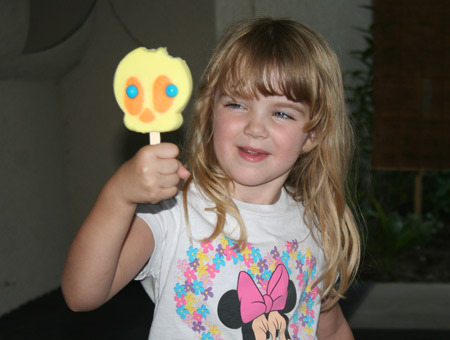 I love that all of Amara’s friends and the kids of all of our friends always remember that I have popsicles in the big freezer and they always ask for one! Kids remind us that we have a primordial bond with ice cream. Great text and pix. Biting off eyeballs and spitting ’em out is something ONLY grandpas can do with finesse. Such adorable photos. We have an ice cream truck that comes around every once in a while, but I think it scares rather than attracts the children as it plays horrid music and looks rather unkempt. Maybe I should get an ice cream truck of my own and give the guy a little competition.